Back to the main story. The three of us each had an objective, all to be completed before we returned home. First and foremost, Starbucks was needed to start the day. Mom could care less about it, but she goes along because she is outnumbered. Next, my picture-taking Aunt had to get photographs of the fountain in Forsyth Park (yes, we had to pose in front of it). Then the cemetery lover in me HAD to visit the famed Bonaventure. Next, the true sight-seer and people-watcher (Mom) ultimately decided she wanted a simple drive around Tybee Island. She wanted to see how things had changed since her last visit, even though she hates change. (Love ya, Mom!) And our final objective was, of course, food. 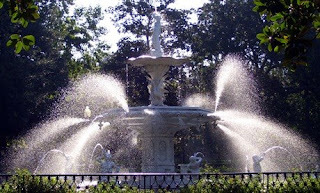 Forsyth Park was laid out in the 1850's, and the city of Savannah has done a great job of maintaining it for the past 150+ years. 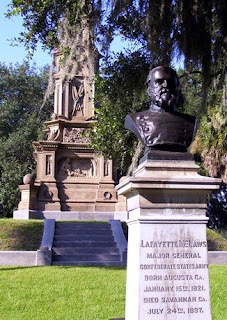 In addition to the awesome fountain (no picture I took could do it justice) and many moss-filled trees, there are monuments for a few Civil War figures. One was for Lafayette McLaws. Pvt. William M. Achord, Sr.
1st Lt. Robert F. Jones, Jr.
Pvt Martin E. Kirschbaum, Jr.
After leaving Forsyth Park, we made our way to Bonavanture Cemetery. I have posted about it a couple time before. It is everything I ever heard about and more. The grounds are so beautiful they take your breath away. The artistry of the gravestones is historic and amazing. I don't know what else to say. We spent hours there, and yet there is so much I didn't see. All transcriptions I made and photos I took are here at the Southern Graves site. I will include some of my favorites here. Thanks for following me to Bonaventure Cemetery! 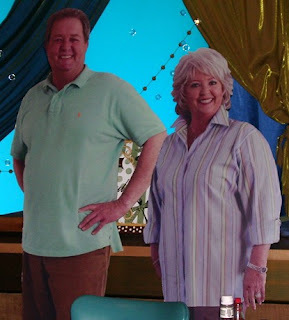 By the way, we did take that drive around Tybee Island, and we later ate at Uncle Bubba's (yep, Paula Deen's brother). I had a delicious crab cake po' boy sandwich. The cocktail sauce was sooooo good! I didn't have shrimp, but it was great on my fries. Thank you for visiting Tybee! I hope next time you'll stay with us and get to know the wonderful cemetery's even better. I love to go to Bonaventure as well! When you need a tybee fix, please visit my website and blog www.mermaidcottages.com thx you!